Introduced on 28 December 1914, by King George V, the Military Cross (MC) was “awarded to Officers whose distinguished and meritorious services” were brought to the notice of the nation. It was given to individuals that showed immense acts of bravery and exemplary conduct during their acts of duty. The MC is awarded to captains or officers of lower rank up to warrant officers for work within land-based armed forces roles. However, it should be noted that members of the Royal Navy and Royal Air Force personnel have received the MC for their outstanding services carried out on land. For more senior individuals demonstrating such acts of bravery or commendable behaviour, they would be eligible for the Military Medal. It is possible to receive the MC more than once in an officer’s career. Once the individual has received the MC, they will get a bar for each act or demonstration of duty which would otherwise have won the MC for the person. The bar is fixed onto the ribbon section of the Cross for each subsequent act. It is a straight and plain bar bearing an imprint of the Imperial Crown in its centre. The first recipient of the MC was Captain Francis Victor Wallington RFA who was the first of four men to be awarded the MC on 26 January 1917. He later went onto receive the MC several times (four in total!) along with several other military awards of excellence! He received the first bar for “conspicuous gallantry in action” (16 August 1917), the second bar for “devotion to duty in rushing… [to save men] buried by shell fires” (25 August 1917) and the third bar for “devotion to duty under close enemy machine-gun fire” The awards are open to individuals not only from the UK, but across the entire Commonwealth. Since its introduction, thousands of MC awards have been given out: the majority of these have been within the UK, Australia and Canada. During the WWI 37,000 MC were awarded. However, there were a select few, who like Captain Francis Victor Wallington RFA, received multiple bars for recurrent acts of bravery. There were four recipients that attained three-bars, 170 individuals received two bars and over 3,000 servicemen received one bar. To be a recipient of the MC was a huge honour, worthy of mentioning within The London Gazette. Though still a highly converted award, the list of recipients of the MC by The London Gazette stopped in 1920. The most recent recipient of the MC is Marine Medical Assistant Harry Thomas Robinson of the Royal Marines. He received the award in October 2013 from the Princess Royal at Buckingham Palace. Marine Harry Robinson was given the MC for his bravery during an incident in the Nahr-e Sarah district of Helmand province. Despite being shot at by a gunman and having to work under complete darkness to avoid being spotted, the 24-year-old persisted in providing his colleagues with excellent medical attention. Though Marine Robinson acknowledged he was not being tactical in his work, he knew he had to “do the best job [he could]… everything else [went] out of the window”. This is the spirit of the MC, bravery and great acts of dedication often in the most trying and tiresome of periods. So how much is a Military Cross worth these days? Last month, the medals of “Clem” Clements, who won three awards for gallantry during the Second World War, sold for £98,400, more than double the estimate, at Spink, the auction house. Also sold were the medals won by Spitfire hero RF “Pied Piper” Hamlyn, which realised £90,000 – again, far above their estimate. Walter Tull enlisted in December 1914 and rose through the ranks, fighting at the Battle of the Somme as a sergeant and then being promoted to the second lieutenant, despite a military rule excluding “negroes” from becoming officers. After leading his company of 26 men to safety in Italy, Tull was cited for “gallantry and coolness”, although he never received a Military Cross despite a petition supported by the former Tottenham striker Garth Crooks. His story was featured on the BBC’s Antiques Road Trip which detailed his remarkable life in the Northamptonshire town of Rushton before the war through a series of photographs and documents. 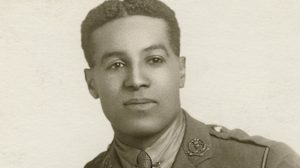 Filming was completed in April but Phil Vasili, who wrote his biography Walter Tull, Officer, Footballer in 2009, has since uncovered new evidence that could suggest a reason for the army’s reluctance to recognise him.